The Sindh province usually does experiences a post monsoon spell in some years during the month of September due to the formation of a weather system (upper air cyclonic circulation) in the Arabian sea or a weather system (low pressure) over western India. According to weather history, Sindh has experienced tropical activity in September or October which do fall in the category of a post monsoon. On September 1, PWP mentioned in the Monsoon of Pakistan page that a weak post monsoon activity can occur in Sindh in Middle of September (first post spell occurred on Sept 13 which brought 13 mm rain to Mithi). While another spell can occur in coming days as a low pressure over lower central India is moving in a SSW direction. On September 8, PWP mentioned in it’s Pakistan Weather Update & Tropical Watch that a tropical activity can take place in the Arabian sea in the third week of September, a system can intensify near Maharashtra coast however as we see that has been now scheduled for the fourth week. Update on September 23 at 10:00 pm PKT – Watch for a low pressure! On September 19 an intense circulation over north Bay of Bengal intensified into a low pressure over Indian state of Odisha and adjoining west Bengal, it continued to move in a westward direction though later changed it’s direction to SSW. 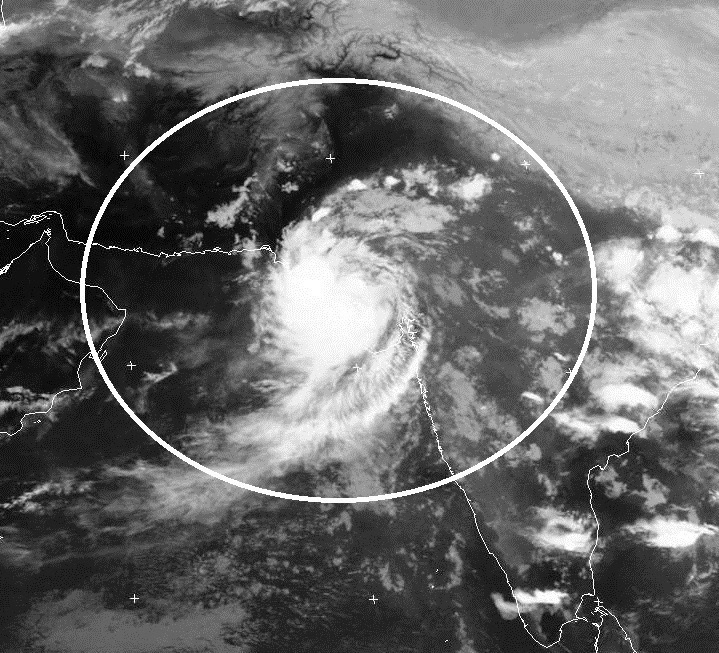 On September 21, it was over south of Indian state of Madya Pradesh as it tracked in a SSW direction with a circulation south-west of the system. COLA AUS: On September 24, the system could track towards Maharashtra and adjoining Gujarat coast and from September 26, it will start moving towards Gujarat coast. On September 27/September 28, it will be near Gujarat and adjoining Sindh coast with possible intensification into a minimal depression. GFS UK: It is showing similar to the COLA Model, with back and fourth movement (possible minimal depression) around the Gujarat and adjoining Sindh coast with complete dissipation during the first week of October near Gujarat-Sindhi coast. Hot temperatures with chances of drizzle/showers with thunder/lightning in Tharparkar, Badin, Thatta and Umerkot districts till September 25. Increase in activity can happen afterwards – On September 27/September 28 (+1,-1 day error), rain with thunder/lightning along with gusty winds can occur in Thatta, Badin, Tharaparkar, Umerkot, Mirpur Khas, Tando Muhammad Khan, Hyderabad and few adjoining districts. Coastal areas of Thatta district (Keti Bandar and Shah Bander), Badin and few adjoining areas can experience heavy downpour and strong gusty winds along with rough sea during that mentioned period as strong thunderstorms will be near its coast. Hot temperatures will continue this week, on September 27/September 28 (+1,-1 day error), rain with gusty SE/NE winds can occur in the metropolis with high tides. COLA shows >15 mm rain while GFS shows >10 mm rain during that period. According to the Hong Kong Observatory, Karachi’s average September rain is 22.8 mm. COLA and GFS maintained the tropical depression run till the morning of September 24 however after that they have shown that an incoming western trough ’22’ would impact the overall track of the system, rain can occur in the northern areas of Pakistan in coming days. According to the numerical models, the low pressure instead of moving in a WSW/SSW direction (entering Arabian sea), it has moved in a WNW direction and now lies over western Gujarat over the Kutch area of the state, it has further intensified. The process of re-curve can start from tomorrow evening/night and the system can move in a brief NNW direction before moving in a ENE direction. After that COLA shows the weakened system to again enter eastern Gujarat in a SSE direction. On September 25, 2001 – A depression later strengthening into a Cyclone over Arabian sea. It’s trough brought clouding to SE Sindh. On September 30, 2004 – A depression formed near Indian coast that late intensified into Cyclone Onil bringing more than 100 mm rain to Thatta. On September 21, 2006 – A depression formed over northern Arabian sea near Gujarat coast that intensified into Cyclone Mukda, it affected no land and dissipated over water. ← Harvest Moon: The Rise of the Orange Moon! how much mm rain we can get ? and it could be joyful aur destructive? Which city? Not likely to be destructive as per the latest track. Weldone Babar Bhai….Babar bhai humary City Mirpurkhas m kitni mm rains ho sakti hai??? Depends upon the track, GFS model shows less than 10 mm rain in the city. I dont think that any ‘widespread’ activity can occur. Most rain will fall in eastern districts though the eastern winds can dominate most of the lower Sindh beyond eastern districts, little rain with windy conditions is seen including Karachi, sea can be somewhat high. what will happen in south punjab forecast? Some high level eastern clouds at the eastern parts of the province. Showers/Rain can occur with chances of isolated heavy falls in Tharparkar district. Hyderabad, mirpurkhas nd badib districts? Could it effect the crops? 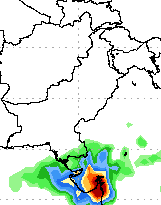 Slight chances in Hyderabad while some what greater chances of rain in Mirpur Khas and Badin. Dates are mentioned. and please mention the date too on we can get proper rain? Currently no website is showing even a drop of rain in Karachi and very little rain for southeast Sindh. Why is it so? For past couple days they were showing rain, good rain was to fall in Karachi however this morning the track of the system has changed due to the changing atmospheric conditions due to which the weather websites are showing little to no rain. PWP would issue a update tomorrow night. When will you update some good news? Here in hyderabad we are boiling as the temps are unbearable. Dont expect much, have given a mini update, tomorrow will give a final update on this weather system on the article. I think you are no more interested in your blog because i check it 10times a day too see any update but all i find is the same old posts and updates. Whenever I am free, I shall update it. Babar bhai humari city Mirpurkhas m aj means 26th September ko 3 heavy speels huye hein mgr kixi bhi site pr yeh maloom nhi ho rha k kitny mm rains hui hein?? ?our 27th our 28th ko humary City ka weather kexa rhy ga??? PMD says 45 mm rain recorded, the system is moving eastwards chances are decreasing now. what about sukkur any chance of rain here ? Not now as the weather system is moving away. The fun is not over yet,..This system will again move towards Mumbai with high intensity. and there chances of formatoin of deprression in Arabian sea if tis maintains its strenght after crossing Mumbai. Babar bhai Mirpurkhas City ka weather kexa rhy ga wednesday ko??? I think some good rained did occur in Mirpur Khas. Day temperatures ranging from 38C – 40C. Sea breeze has been cut off since last many days as a tropical low was very near Sindh, now it’s remnants are near Gujarat coast. High temperature is common October. Oh yeah I thought it completely dissipated.